KimoYES Gift Vouchers make the perfect present for that special someone who needs creative inspiration. Please see the bottom of this page for more information. Vouchers are sent FREE by regular mail (including international), and come with a complimentary fabric sample swatch pack! When adding the voucher to your shopping cart, you may enter your name, the name of the recipient, and a message (this information is optional), and this information will be printed on the gift voucher. 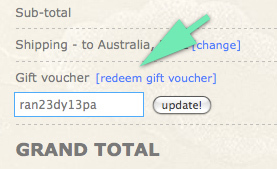 If you need the voucher quickly, simply let us know and we'll email it to you (in addition to mailing it). Vouchers are available in Australian Dollars, but you may purchase and use them in the equivalent currencies available on our website. Vouchers can only be used once, with any remaining credit becoming invalid.